Style: A very fine fizz with refreshing and fruity nose. A solid bisquity leecy and jet soft creamy palate to follow. Hints of lime and lemon. Experience a gently smooth sensation of fine mousse which still shows the fruit dominantly. Made from organically grown grapes and handcrafted to perfection. Vinification: The wine base was harvested early and pressed from hand-selected grapes of a single organically grown vineyard. 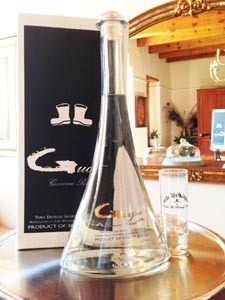 Style:Triple distilled, very smooth grappa made from Cabernet Sauvignon (Grapes grown on the farm). Very gentle, slow distilling process in a traditional Cape Dutch copper potstill. Crystal clear fine spirit, handcrafted and hand- labeled, this fine spirit comes in 500 ml imported bottles. Limited Release (6 per customer). This grappa is among the best produced in the country. Enjoy like the Italians: have it with an espresso at the side or pour it into the coffee. 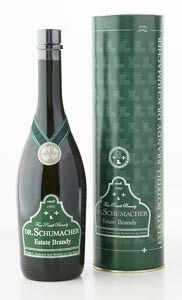 Dr.Schumacher fine Potstill Brandy is double distilled in the tradition and method used in Cognac, France and matured in genuine french oak barrique. The grapes are cultivated on Oude Wellington and produce a unique wine to become fine potstill Brandy. Tel: +27 (0)21 873-2262 | Fax +27 (0)86 619-9398 | P.O.Box 622, Wellington 7654, R.S.A.